The Wednesday Nighter has finally started. Tim Bechtol once again is putting the series on and was in charge of this weeks course. Tim provided us with his specialty of long laps and bumpy terrain. There were a ton of riders there. However, when Tim called the Men's A/Master A to step up only 10 or so riders rolled up. We had Bob, Kyle, Matt, Troy, Bessete, Bill, Horan, Dillon, Wehyrich, Fiore, and myself. Sorry if I forgot anyone. I looked back and there were 30 or so Men's B/Master B. Whoa! Great turnout, and great for the future. Not much time to ponder that, because next thing I knew we were shooting down the straightaway. I got the whole shot, and was really surprised to be in the front. It's like what Bryce was talking about in his race report from Rad Racing. Anyways we'll keep it simple for now (hopefully more detail on the team blog). Bob attacked on the first lap through the bumpy field and no one followed. He rode away. Elliot chased hard and spent lots of time solo until Bill caught him about halfway through the race. Bill ended up taking a nasty digger, but was looking strong most of the race. Fiore and Wehyrich rode super consistent and traded blows for most of the race in 1st/2nd Masters, 4th/5th overall. Horangatang faded a bit towards the middle, but him and Troy worked together which allowed Ben's legs to regain strength and put in a good last race charge. Troy rode consistent and did good work all race long. Me and Matty were having bike issues and kept swapping places. Matty ended up not finishing and I hooked up with the Wehyrich/Fiore train. Kyle and Dillon did battle for awhile but I don't know who beat who. Meanwhile, while all this was going on Bob was extending his lead. He had a biggest gap of the whole race. Impressive. Great victory for Sophia SAK Kircos. She has been putting in the time at practice and it paid off. Her technique and overall toughness earned her a well deserved victory. Newcomer Ali rode a great race and finished second. Go Red Dragons! NRO's Joey looked good in third and looks to be a crosser of the future. Un-offiical: Sophia, Ali, Joey, ??? Well this was the real race of the evening. I don't know how many starters there were but it was intimidating. There were lots of dirt mounds on the course and our resident MTBer Jeff Bookwalter put on a show. He stole the victory from a hard charging Andrew and Downtown JB. From other race reports it sounds like Dunphy had a good race, as did Bad Bryce, and Dusty. Boy, Bookwalter is just mean on that mountain bike. What a great result in possibly the biggest B field in all of Wednesday night history. The men's masters B result was close to my heart as Brent Ruby took his first ever victory. This triathlete has finally seen the light and made his name in cross. Great job Brent! Props to T. Sullivan for starting in the back and fighting through the whole field. As usual race reports, corrections, and comments are welcome. Thanks everyone. Of the many rumors swirling in recent weeks about Lance Armstrong, one of them has included him racing cyclo-cross events this season - and that rumor appears to have some truth. While the details of his 'official' comeback are not to be released until Wednesday morning when he will announce his 'official' comeback at the Clinton Global Initiative Annual Meeting in New York, his manager Mark Higgins confirmed with Cyclingnews that his first race following that announcement will likely be the UCI category 1 Cross Vegas cyclo-cross race held in conjunction with the Interbike trade show in Las Vegas. "We are going to try to make it," he said. "It will be tight with so many heads of state at the Clinton Global Initiative [event] and then air traffic control as well." While the events are scheduled for the morning New York time (EDT) and the men's Cross Vegas race does not start until 9:00 p.m. (PDT), Armstrong's private plane could be at the mercy of the US air traffic control system. Seeing nothing behind me but empty space as we waited for the gun Saturday left me with only one positive thought: at least I won’t get passed tonight. This year’s Starcrossed marked not only the beginning of the ’08 season, but also the start of a new series for me with my recent move to Seattle. So instead of battling it out with Dougger, Phil, and Hartman at the Fort, I’ll be relaying stories of fighting the slop with hundreds of strangers in Puget Sound. The rain, technical course, and old MT camaraderie worked in my favor and led to a better-than-anticipated race around the velodrome. With 85+ people wound up, staring at a couple hundred yard sprint to kick off the race, there was no doubt that a good start was crucial. Shaun provided just that, and I was able to follow the pink highlighted cougar on his back as we worked our way from the tail through the masses heading in to the first turn. From there aggressive riding, breaking spirits, and undirected anger were key in continuing to pick people off throughout the race. I even started to think Bill Martin might have been on to something with his token 'what happened?' starts and flying finishes during Wednesday night races. Getting caught and passed after a half-hour of pinning it is the mental equivalent of getting your balls slammed in a car door, so it was nice to be on the favorable end of the door closing. My legs felt strong, my lungs held up to the most work they’ve seen since moving to sea level, and not even a late race wash-out and chain-drop could wipe the dirt and slobber-caked smile off my face. In the end, 45 minutes proved to be just the right amount of time to spend in the red as I rolled across the line in 9th, 72 places ahead of my starting position. A motivating start to the season that reminded me that, while Starcrossed is no Rolling Thunder, this sport is still the best racing there is on two wheels. For those interested, I’ll keep you all posted on how the white, pink, and blue coug hangs through the season in the cross-soaked northwest. I like the comment on my last post about the grammar. My grammar is always bad but two nights ago it was particularly bad. I wanted to write something, but it was late and so I just scribbled. Rad Racing yesterday was great. Everyone had solid races. In the 4's Joel Brown led the charge with a solid 8th place. Bryce Daviess made his cross debut and ended up 18th. The 3 race saw Elliot, Matty, and myself have excellent starts. Bessette held on for a great 8th place. Matty and myself battled through mechanicals. I ended up 19th and Matty's bike stopped working on the last lap. KSS had solid consistent race and finished up in 35th. 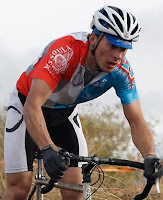 In the masters race MT Cross rider John Fiore showed us young guns how to ride with a great 5th place. Missoula homie Mike Longmire road excellent to claim 2nd in the same race. Dave Towle was giving Montana shout outs all day long. He was impressed that there were other people hitting cross in Montana besides Geoff Proctor. I thought it was funny, because almost everyone we talked to who was in the scene asked if we knew Geoff. It was great for the team, and cross in Montana. Look for race reports to start coming in. I started it off with my report of Rad Racing. Star Crossed had come and gone. Downtown JB has the photos for this post because I got to wild watching to elite race and forgot to take photos. Here's a quick summary. Montana ladies Sophia and Kelly has good races. Kelly creeped into the top 25 and Soph rounded out the top 40. In the masters J. Fiore held his own on the technical terrain and placed in the first half of the 80 rider field. In the 3 race Bessette started hot and over cooked it in a corner. He flatted out. Toby was killing it. Even with his last row starting position he managed a 11th place. Horan and I rode together for awhile until he started attacking the group we were in to soften them up. It worked perfectly and helped me slot into the top 30. Kyle rode strong, but got injured early on and had to tough it out in the second half of the bunch. In the elite race Dale drank to much coffee and started the race in the last starting position. He worked his way up but killer side ache ruined his evening. He ended up maybe in the top 40. Team Kona and Cyclocrossworld.com battled for the victory. Powers outlasted Trebon as he was having trouble passing lapped riders. Notable performances came from Russell Stevenson who finished 5th, and Nick Weighall who cracked the top ten.